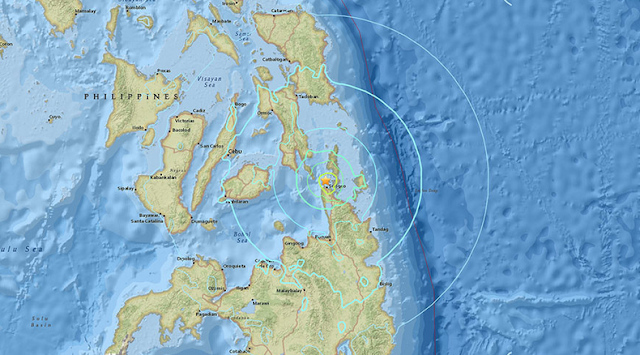 A strong earthquake with a magnitude of 6.5 shook a southern Philippine region late Friday, damaging some buildings, knocking out power and sending residents fleeing to safety, officials said. There were no immediate reports of injuries from the quake in Surigao del Norte province, which struck about 14 kilometers (8 miles) northwest of Surigao city at a relatively shallow depth of 11 kilometers (6.8 miles), officials said. Renato Solidum of the Philippine Institute of Seismology and Volcanology and the U.S. Geological Survey said there was no threat of a tsunami from the quake, which was caused by movement of the Philippine fault. Many residents were roused from sleep by the shaking and rushed into the streets, with some children crying in the confusion, coast guard personnel Rayner Neil Elopre said by telephone from Surigao city. "The shaking was so strong I could hardly stand," Elopre said, adding that village leaders asked many residents to move to a high school building on higher ground. He paused briefly as a mild aftershock struck as he talked on the phone. At the coast guard office, plates and other objects fell to the ground, he said. Surigao del Norte police chief Senior Superintendent Anthony Maghari told ABS-CBN TV that a small elementary school building reportedly collapsed, some debris fell from other buildings, and a bridge was damaged, although there were no immediate reports of injuries in the province. The Philippines lies on the "Ring of Fire," a line of seismic faults surrounding the Pacific Ocean where earthquakes and volcanic activity are common.